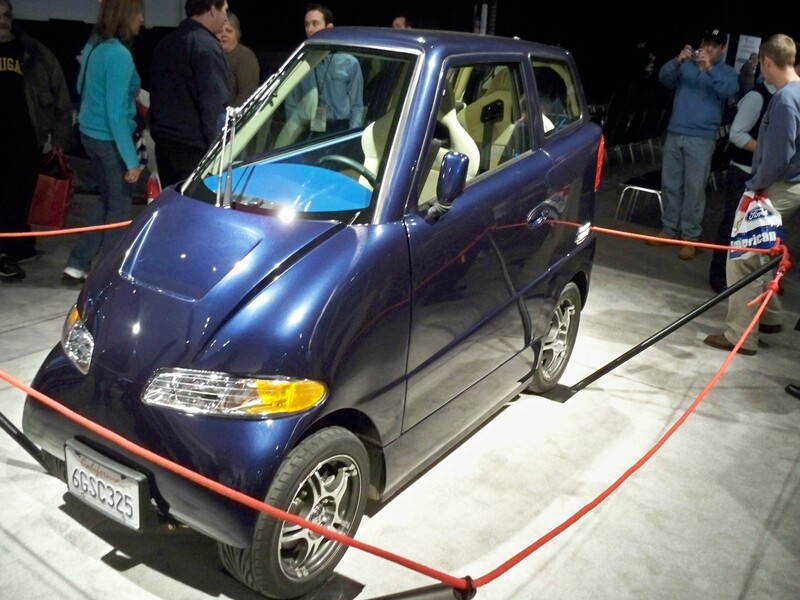 Last Year’s 2009 Detroit International Auto Show was summed up my most as “disappointing as the city it’s held in”. I was not planning on attending the 2010 Detroit International Auto Show, until late November I heard there will be a new attraction at the 2010 Auto show. 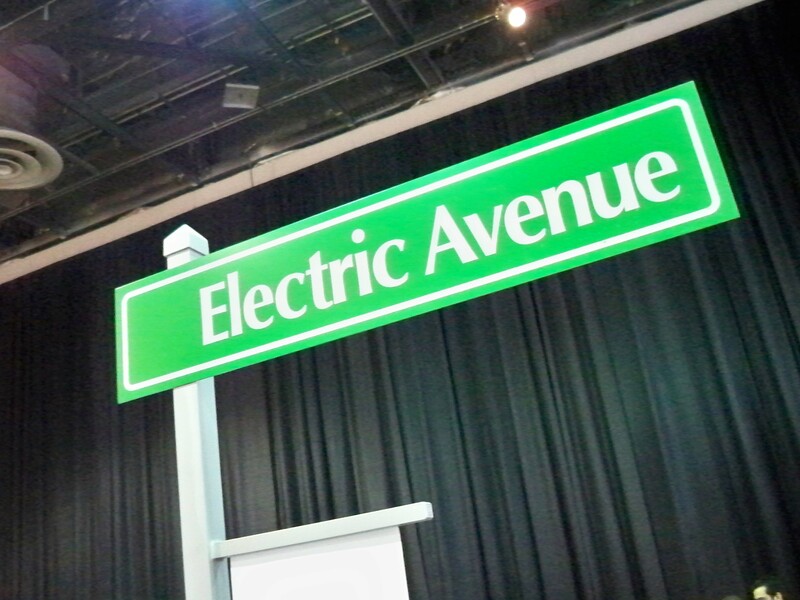 This new attraction was labeled the “Electric Avenue”, several automakers would proudly show off their new advanced Fully electric vehicles, and some new highly efficient Hybrids. 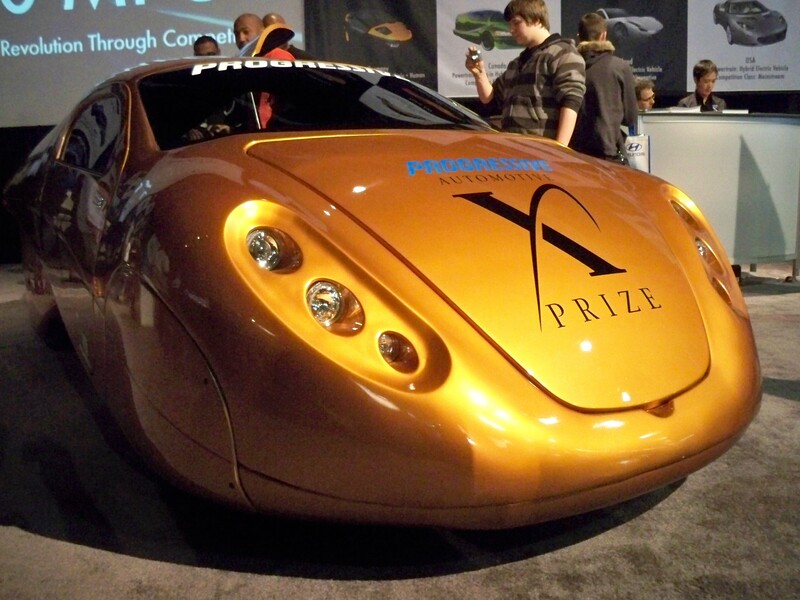 Along with the larger automakers, small teams competing in the new “X prize” attended to show what they have accomplished on the road to energy independence. Immediately after walking in the front gate was the ever impressive Tesla Roadster, along side was the super advanced and affordable Model S. They Had a very Impressive display this year with 2 roadsters, one model S, their drive train, battery and speed controller on display. They had several representatives there ready to answer your questions. 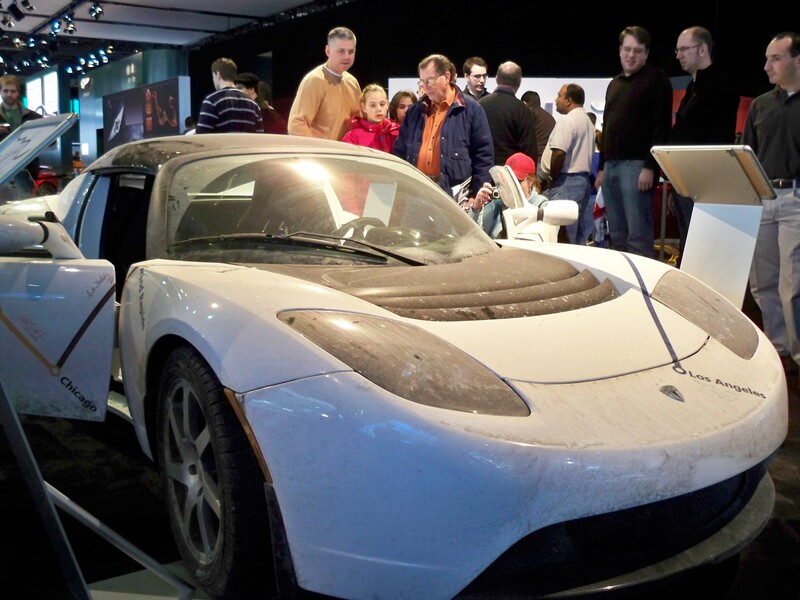 The famous “Roadster 750” was there, still dirty from the drive across country to show how viable and usable electric vehicles truly are. 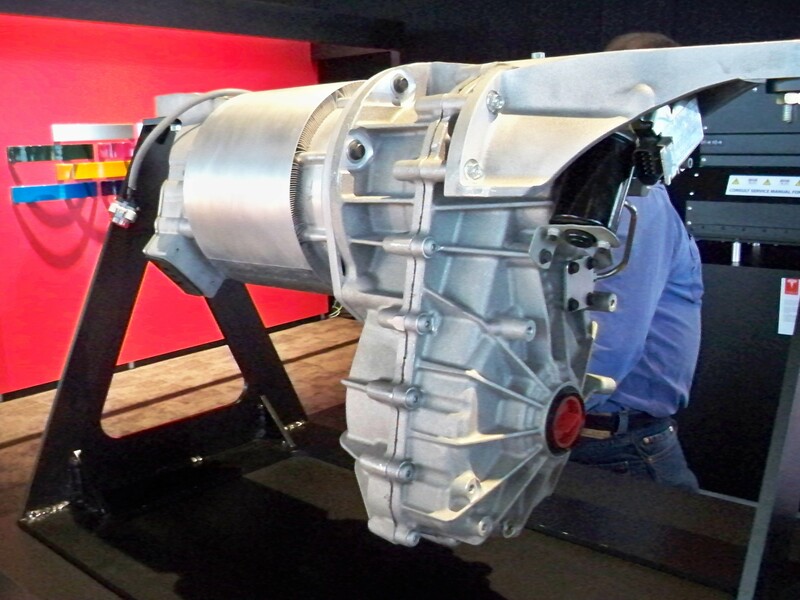 Tesla did a great job proving how simple electric drive trains really are, they displayed their one speed, direct drive, 215 Killowatt, 295 ft/lbs torque electric drive train right across from the Mercedes new Bluetec Diesel drive train, the pictures do the justice. This just shows how incredibly simple electric drive trains can be, and how few moving parts there are to wear out, and without running a dirty carbon based fuel which will inevitably coat the inside of the engine in hard to remove, and damaging carbon deposits. 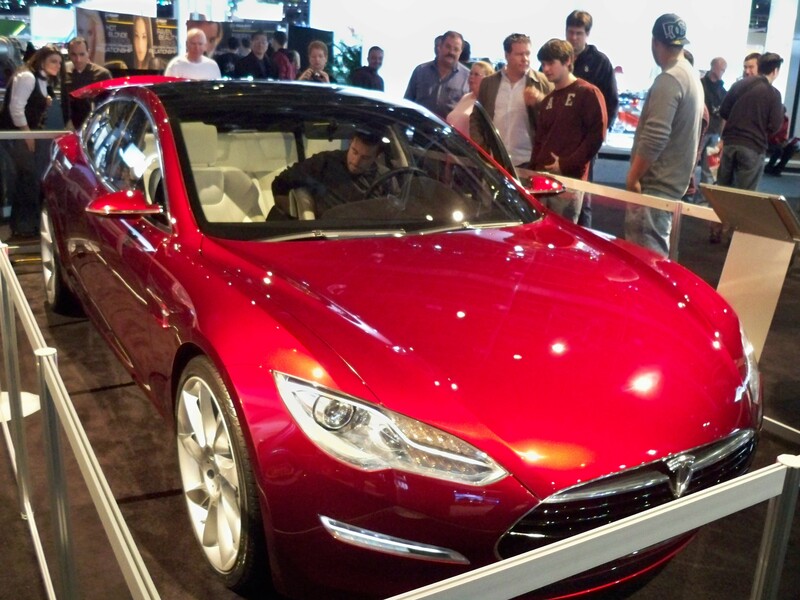 -Thats it, Tesla’s motor and a gear reduction! there is only about a dozen moving parts, and 2 qts of lubricant oil. 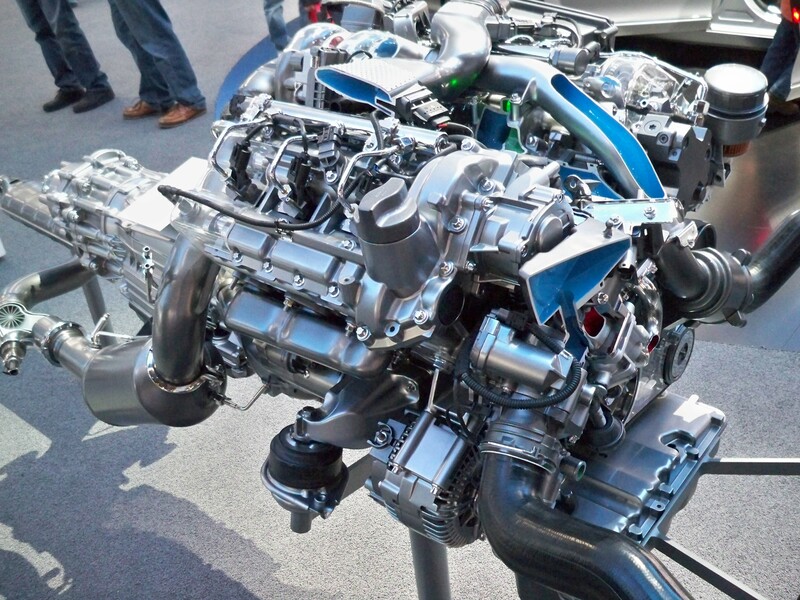 -The super complicated Mercedes Bluetec Turbo-Diesel, mated to a 7-speed automatic transmission. These 6 cylinder engines have an average of 200+ moving parts. several gallons of coolant, 8.5 qts motor oil and 9 qts of transmission fluid. The very impressive Audi E-tron has not been getting the attention it deserves, The majority of people in the Audi display were starring at this beautiful E-tron. Not only is it aesthetically appealing, but the performance is not lacking either. Audi being the never disappointing automaker they are, they kept the quattro all wheel drive by utilizing four motors, one at each wheel. With four motors and lots of battery space the E-tron has 313HP and 3,319 ft/lbs of torque (that is not a typo 3,319) I will give you a minute to retract your jaw from the floor. The quattro system uses four motors and the use of a “Torque vectoring system” which gives the Audi un-dreamed levels of agility and handling, un-matched to those of gasoline powered sports cars. The car may not be in everyone’s price range quite yet, at a stunning $200,000 it may be a while until I own one. 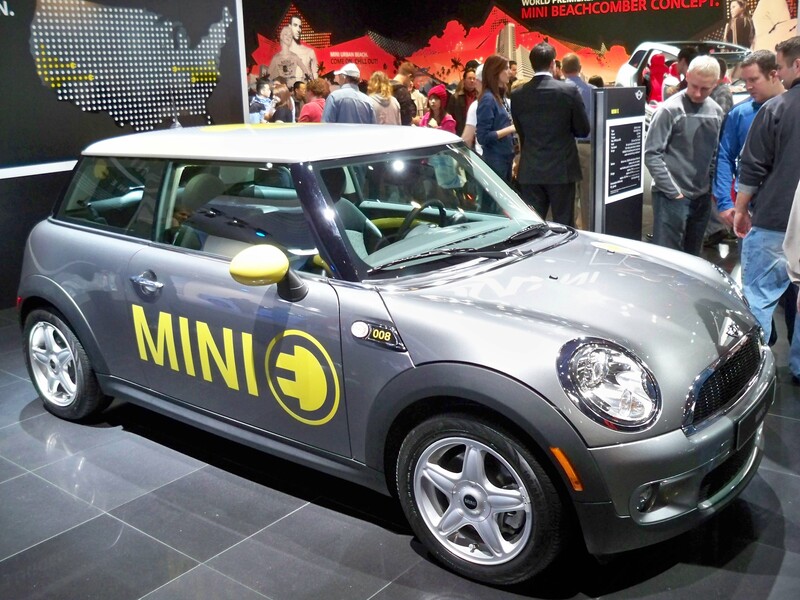 Perhaps not as stunning as the E-tron, the Mini-e has a promising future as an electric vehicle. With its small size, exceptional handling, and all around good looks this EV will has a plentiful market. It is powered by 150 kW (204 hp) electric motor and has a range of 156 miles/charge, this Mini will prove to be a great urban car for city dwellers that value a small parking spot, but usable trunk space. Although no price has been announced yet, there are leases that will be available very soon. 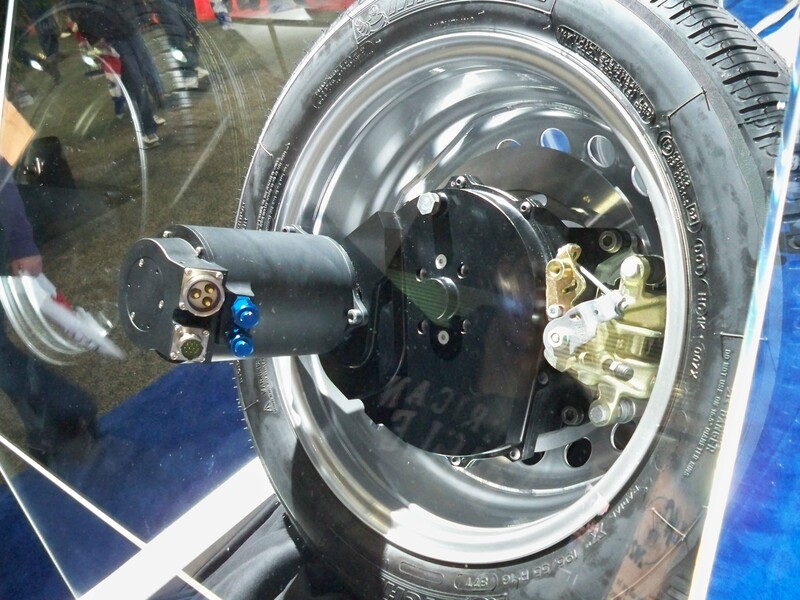 Michelin, an unexpected exhibitor at the Auto show had a very impressive display showing there partnership with electric vehicle manufactures to produce Motor-in-wheel technology and specifically designed electric vehicle tires. 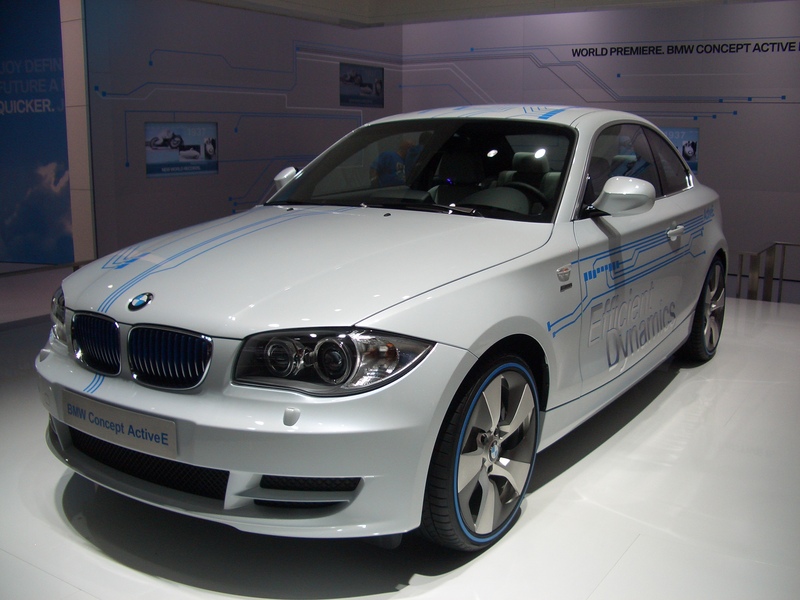 The Motor-in-wheel designs were state of the art to help reduce un-sprung weight and improve efficiency in every way. There exterior mounted disc brakes are based of existing technology making servicing simple. Their electric vehicle tires were specifically designed to help grip even under high torque situations that electric power can easily supply. 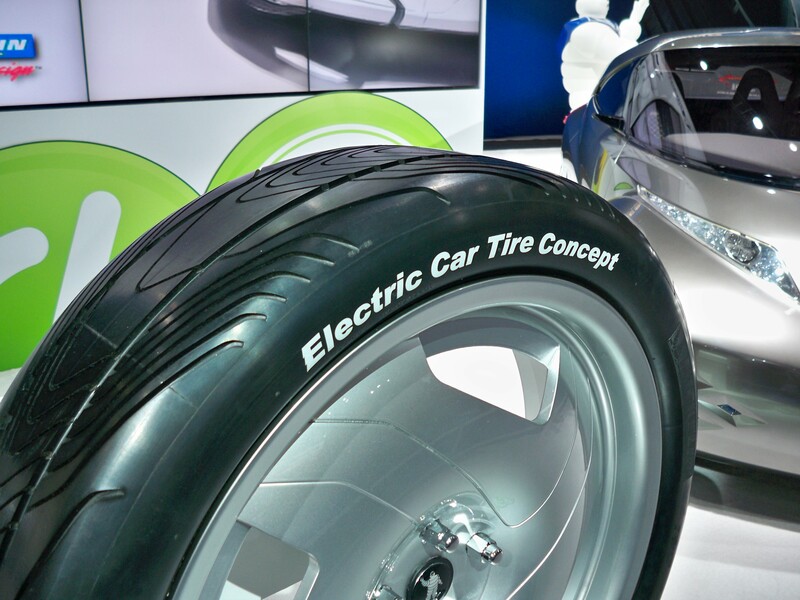 They are improving the tires rolling resistance to give the EV the efficiency it is supposed to achieve. Michelin is most defiantly on the cutting edge of Electric vehicle technology, and has a promising future. 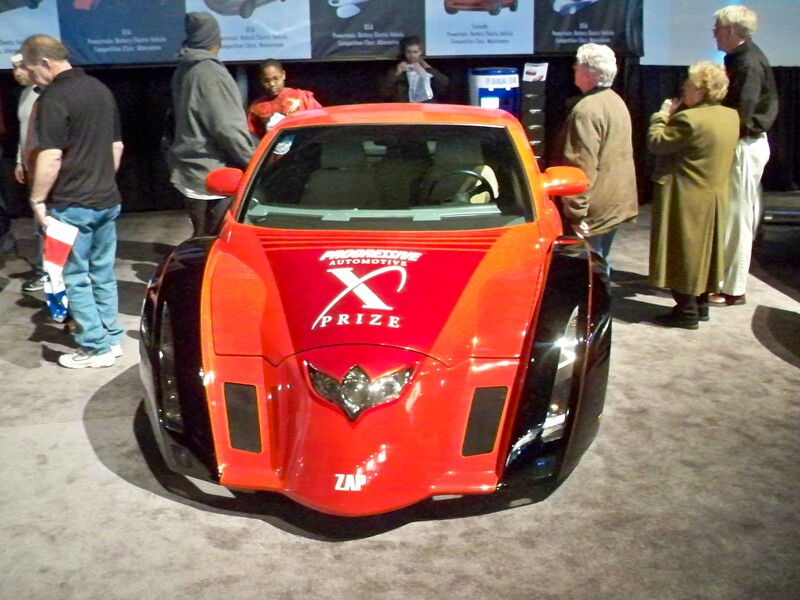 Some of the “X-prize” electric competition vehicles attended the auto show to show off their feats of engineering, Everything from modified shelby kit cars, 3 wheel inverted trikes, and cars that look like they belonged in a sci-fi movie. They all brought something different to the show, either speed, endurance, or comfort, But they all came dressed to impress. Mostly built by teams to pursue a ten million dollar prize, but to win they must be put through, and pass many rigorous tests. Now for the odd duck, they refer to it as the Tango, others may call it a porta-potty with wheels, but we can all agree that it got a lot of attention at the show. The Tango’s unusual shape allows it to “lane split” where it is allowed too, like in California. This means you can drive between the stopped or slow moving traffic. I know what you are thinking, this thing looks tipsy, but it uses all its batteries as ballast which is mounted literally between the wheels to give a very low center of gravity. The acceleration is amazingly fast with two dc motors powering the rear wheels it achieves 0-60 in 4 seconds and a top speed of 130mph, if you dare to go that fast in something narrower then most coffins. On top of this the Tango can park just about anywhere, and carry a passenger, well a small passenger. This all sounds stupendous, but with a price tag of $108,000 many people will opt to purchase a Tesla Roadster, or two Model S’s. Its not that I do not like the idea of the Tango, in fact for urban areas I could see this as a viable transportation option. Tango, you dared to do something different, to that alone, nice work! The ever popular BMW appeared on the scene with an electric version of their hot new M1 labeled the “ActiveE”, its slick looks and exquisite engineering will defiantly prove to be a capable electric vehicle of the future. For now there are few specs available other then its 100 mile range, BMW hopes to improve this greatly before the ActiveE goes to the market. With GM teetering on the edge of complete collapse, they hope to gain new market shares and new investors with their Chevy Volt. This Series hybrid uses only battery power for a mere 40 mile range before the Gasoline engine kicks on to only act at a generator and start re-charging the battery pack. The Volt has comfortable seating for four and aesthetically looks fairly nice. The disappointing areas of this car is that you must now maintain both a Gasoline engine and a electric drive system, this type of setup requires many complex computer controlled systems, and is similar to blending an automobile and an airplane, it doubles the systems and becomes a over complicated mess that nobody can repair or diagnose. Unfortunately GM failed to see this, and has produced an expensive to purchase, expensive to operate, and expensive to service vehicle that still requires gasoline. Because of these reasons alone there is nothing on this car will save energy, nor is it “green” it still requires gasoline to operate past 40 miles, and that’s if you are not using the A/C or heat! This car was inherently a failure from the drawing board, unfortunately GM cannot see what the public wants. 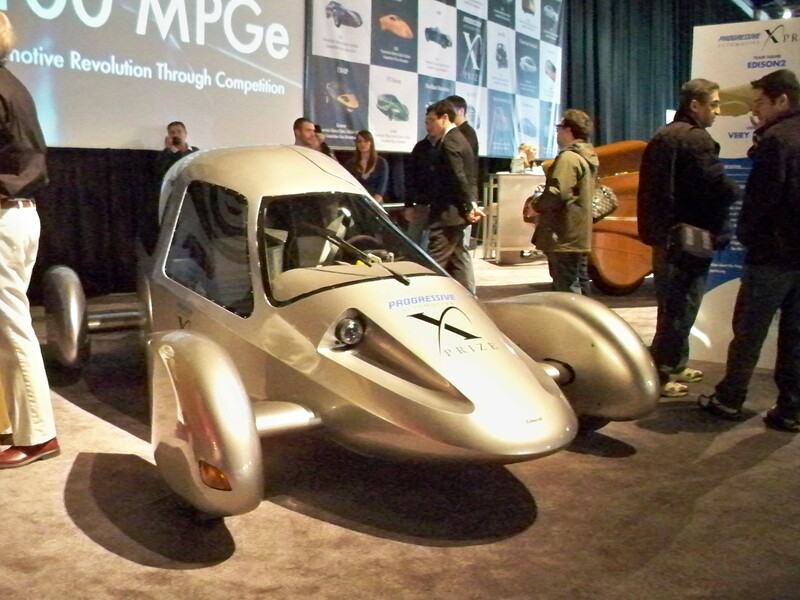 GM should admit they screwed up in the past with ending their EV-1. Hopefully GM will eventually pull their heads out of their rear, and build something that is simple and something the public will be impressed with. It is disappointing to see that GM had the technology to develop a 75 mile per charge EV1 over 17 years ago, and that was with simple lead acid batteries! If GM would have stuck with the EV1 their technology would have advanced to a level that could supply hundreds of miles per charge. But no, for some un-known reason GM felt the need to crush the existing cars, and stop the project in its tracks. 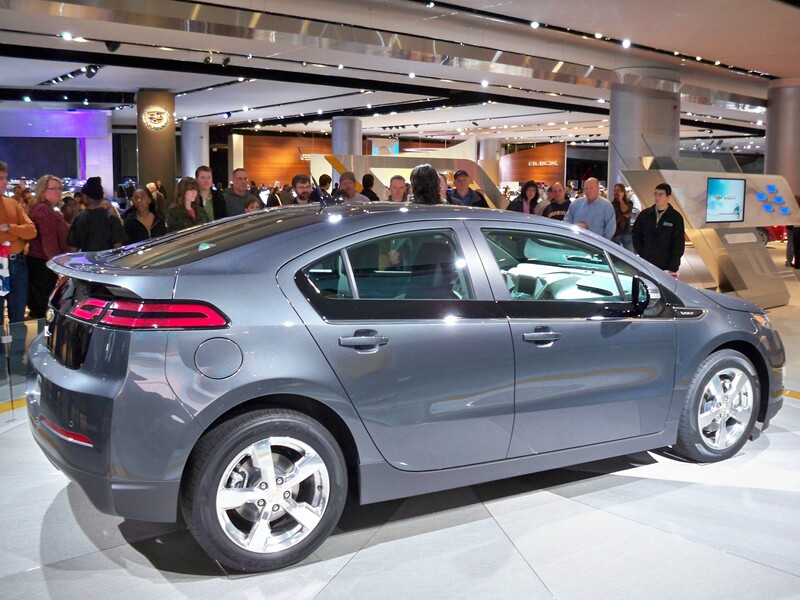 This new Chevy Volt is a sorry excuse for what they could have achieved otherwise. 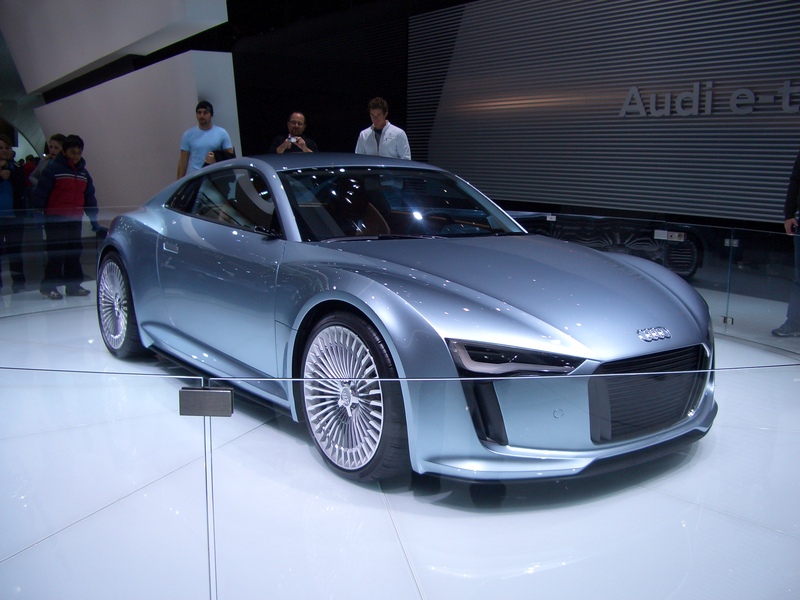 The 2010 Detroit auto show had some new exciting vehicles and prototype’s there, The electric cars were there in force from many manufactures and will hopefully continue to grow in the oncoming years. The days of owning an affordable electric car will be upon us soon, and driving to work may soon cost less then the change in your pocket.